Gift Certificates are the same as money...Your money! To protect our customers, an email will be sent to you within 24 hours of purchase, providing you with the Gift Certificate number which may be used on future purchases (please allow up to 48 hours if purchased on a weekend). 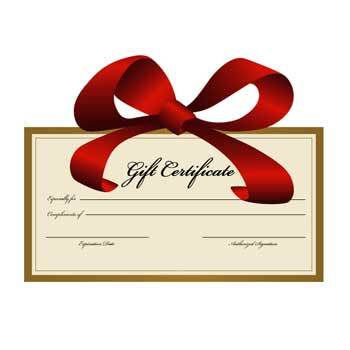 If the Gift Certificate is ultimately intended for another person, you may print or forward our email containing your Gift Certificate number as you desire. Discount Coupons not applicable on this item. 1. If an order exceeds the amount of the Gift Certificate, a credit card or other form of payment will be required for the difference. 2. After completing a purchase, any unused balance will remain in your Gift Certificate account for future purchases (the Gift Certificate # will remain the same). 3. Lost, stolen or damaged Gift Certificates may be cancelled and replaced with a new Certificate in the amount of the then-remaining balance upon proof as required. Contact Justminiaturescale.com Customer service for assistance at 724-838-0505. 4. Gift Certificates are not redeemable on other web sites. 5. To check the balance of your Gift Certificate, call 724-838-0505 . 6. Not redeemable for cash. 7. Gift Certificates expire I year from the date of issue.